There are few full-sized vehicles with the ability to provide rigid design and power, while maximizing comfort for the entire cabin. 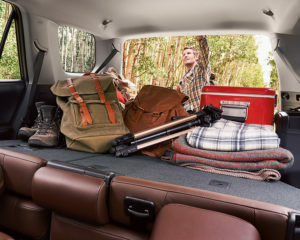 However, with its mid-size SUV design and 4×4 capabilities, the 2019 Toyota 4Runner combines the power and handling of all-terrain vehicles with the family friendliness of a five-to-seven passenger van. All new for 2019 Toyota has added a new package of 4Runner. The Nightshade 7 passenger brings bold new styling, with the exterior setting itself apart. Designed with a series of black accents including front and rear bumpers, dark chrome grille, black roof rack and 20″ black alloys, this 4Runner is cool. This great blacked out look is awesome and the Nightshade also comes along with automatic running boards that deploy and retract with the opening and closing of the driver-side front door. The 2019 Toyota 4Runner’s off-road design is a culmination of heavy-duty body-on framing towards the vehicle’s construction. It’s towing hitch and wire harness, projector beam headlights, and skid plates make it a powerful vehicle, capable of handling all your off-terrain driving needs. No matter where you are, on dirt, water, grass, or uneven gravel, it’s built to sustain itself throughout anything you drive through and take your other toys with you. With a powerful exterior design featuring power moonroof, alloy wheels, roof rails, running boards and more, the 4Runner is well sought after! In addition, the cabin makes all your trips comfortable and convenient with large, supportive, and even heated front seats. For your passengers, the space and seating inside is enough to fit up to five-to-seven passengers, with split-folding 3rd row seats to create more space when you need more storage. 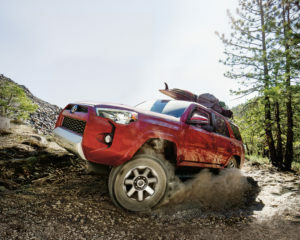 Of course, it’s no surprise that the 2019 Toyota 4Runner’s 4.0-litre V6 engine and 5-speed automatic transmission can handle its 4×4 power and versatility. It’s got ground clearance and a horsepower of 270 hp @ 5,600 RPM, powerful enough to tow large loads up to 5,000 lbs when you need it most. Convenience is key with the 2019 Toyota 4Runner. Inside features a 6.1 inch touchscreen audio system with steering-wheel mounted controls, Bluetooth connectivity, integrated navigation system, and a backup camera. With the Hill-Start Assist Control, you won’t have to worry about the vehicle rolling backwards. The system gently applies the brakes for you to have enough time to accelerate forward. Other features include an available smart key system, keyless entry, cruise control, and more. We know that with all that performance and build, the safety of you and all your passengers are top priority. The 2019 Toyota 4Runner features front, side-seat mounted and knee airbags for the driver and front passenger along with side curtain airbags for the front and rear, bringing it to a total of 8 airbags to keep everyone safe. To make the trip more comfortable, an impact-absorbing body redirects the impact energy away from the passenger cabins, so no one has to feel the headaches or motion sickness of off-terrain driving. 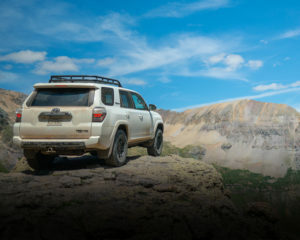 The 2019 Toyota 4Runner is available for customization here at Collingwood Toyota. We carry genuine Toyota parts and accessories like TRD alloy wheels, hood deflectors, plug-in block heater, and more! Order your parts today, so we can have your factory-trained technicians ready to help you out. You can also come to our showroom if you want to learn more about the 2019 Toyota 4Runner.